Food for Thought – Eighteen talks on the training of the heart is an introduction to the Buddhist practice of training the heart. 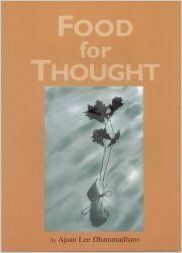 It is taken from the talks of Phra Ajaan Lee Dhammadharo, a teacher in the Thai forest tradition of meditation, and is called Food for Thought because it invites the reader to fill in the spaces suggested by the talks—to reflect on how the images and teachings they contain relate to one another and to one’s own situation in life. Two of the talks included here, ‘Quiet Breathing’ and ‘Centered Within,’ briefly describe a technique of breath meditation aimed at giving rise to a centered and discerning state of mind. The rest of the talks deal with how to use such a state of mind in dealing with the problems of life: the day-to-day problems of anger, anxiety, disappointment, etc., and the larger problems of aging, illness, and death. This is a book concerned less with the techniques of meditation than with its meaning and worth: the questions of why should one train the heart to begin with, what personal qualities are involved in its training, and how to make the best use of it as it becomes trained. An introduction to the Buddhist practice of training the heart.